In the Dalmatian islands, the disappearance after WWII of Italian Lagosta (now called Lastovo) was matched by the equally perfect ethnic cleansing made previously ​​in Italian Lissa (now called Vis). Both of these central-southern Dalmatian islands have the distinction of being the most away from the Croatian mainland, and because of this they are those who have preserved most the neo-latin people through the centuries. In fact, in the Middle Ages before the year 1000 AD there were practically no Slavs in the outer strip of the Dalmatian islands, from Lissa and Lagosta up to Lussino (actual Lošinj). Only the slav pirates called "Narentanes" brought some Croatians -in relatively small amounts- in these Dalmatian islands, but only starting from just before the thirteenth century. Lissa, however, was populated until the Renaissance times almost exclusively by autochthonous neo-latin Dalmatians, who ceased to speak their own native Dalmatian language only around the thirteenth/fourteenth century when the "Veneto da mar" was imposed on the island (favored by the immigration of families from Venice and the Veneto). The island of Lissa (now officially called "Vis") is the most distant from the mainland of the Dalmatian islands. This island has an area of 90.3 km² and had about 3700 inhabitants (all Croats) in 2007. The main locations of the island are the town of Lissa and the villages of Comisa, Manego Porto and Porto San Giorgio. Along with the neighboring islands Busi (now called Biševo), Pomo and Sant'Andrea, Lissa form a small archipelago situated approximately 50 kms away from the Dalmatian coast, which for centuries was a stronghold of the Republic of Venice in the Adriatic. Having belonged for centuries to the Venetian Republic, Lissa was united politically to Italy on two other occasions: during the Napoleonic Kingdom of Italy (1805-1810), and during the Second World War in the Governorate of Dalmatia (1941-1943). Moreover Lissa until the beginning of the twentieth century was the most Italian, in ethnic population, of the central Dalmatian islands. 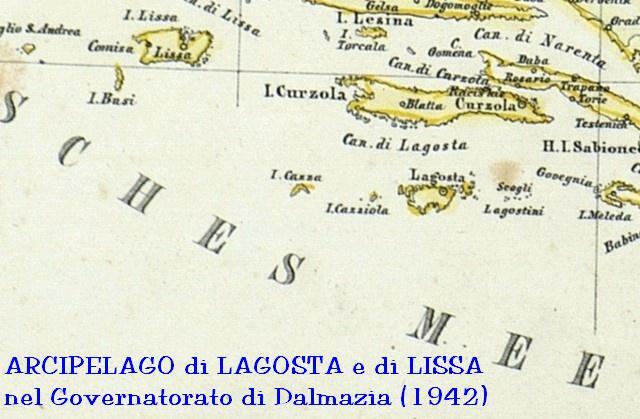 Historically Lissa was a naval base of the Venetian Republic until 1797, when it passed to Austria. Between 1805 and 1810 it was part of the Napoleonic Kingdom of Italy, with Italian as the official language and the language of education/schools. Virtually everyone (even the Croat minority) in those years spoke the "Veneto da mar" (the local venetian dialect), as a first or second language. It was later occupied by the British from 1811 to 1816 (who adopted as the languages of the island the Italian and the English) and then returned into the hands of the Austrians, as a district of the Captaincy of Lesina. In 1811 there occurred the first naval battle of Lissa (when vessels Italian-Venetian and French clashed with British ships for the control of the island). In 1866 took place the historically famous "Battle of Lissa" (it is noteworthy that the Italians of the island- who were famous then as fishermen nicknamed "Venturini" and among the most skilled of Dalmatia with their boats known as "GA(L)ETA Falcata"- saluted with joy the Italian sailors who attempted to land on Lissa during the battle): this naval battle signed adversely the fate of the Italian Dalmatians. In fact, the Austrian policy in respect of Lissa was neutral at first, but -after the founding of the Kingdom of Italy and the italian independence war of 1866- took a sharp bend in favour of the slavs (http://books.google.com/books?id=kMXURN7... Luciano Monzali: Italians of Dalmatia). The French census of the Napoleonic Kingdom of Italy recorded that about 80% of the island population were Italians (but it was a general census, based mainly on the head of family breadwinner). The Austrian census of 1880 was more detailed and counted instead 3292 Italians in Lissa and 1197 in Comisa, out of a total of 7871 inhabitants of the island (meaning that about 64% were Italian-speaking). During the last decades of the nineteenth century the use of the Italian language declined rapidly: the Austrian census of 1900 found that 97.0% of the population used Serbo-Croatian language and only 2.4% the Italian language, with peaks of 3.9% in the municipality of Lissa and 4.6% if we consider only Lissa city (the different percentages reflect the fact that Italians were living mainly concentrated in the urban centers of the cities of Lissa and Comisa). A similar result was reached in 1910, when it turned out that the Italian language was spoken by just 2.5% of the inhabitants of the island. It is astonishing the reduction of the Italian speaking population of Lissa in just 20 years: from 4489 persons (or 64% of the island total population) in 1880 to just 199 (or 2.4%) in 1900! That means a reduction of 94% in less than one generation. After the Treaty of Rapallo, that showed the Italian preference for the island of Lagosta (because of its better strategic position) and assigned Lissa to Yugoslavia, a good portion of the local neo-latin population gradually migrated into Italian territory. Some chose, similarly to some of the Dalmatian italians of Curzola (now called Korcula), just the nearby Lagosta, which -despite being (ethnically speaking) one of the least Italian of the Dalmatian islands- came to have, especially starting from 1921 when returned officially to Italy, a considerable number of Italians inhabitants (about 40%). Lissa, however, was part of Italy between 1941 and 1943, when it was part of the province of Spalato in the "Governorate of Dalmatia". Indeed some Dalmatian Italians returned home in those two years: in that dramatic period (April 1941-September 1943) in the Dalmatian cities and islands returned numerous Dalmatian exiles to carry out their duties of managers, clerks, judges, officers of the various military services, with the intention to contribute with their knowledge of local languages ​​and mentalities to the success of the Italian administration and its acceptance by the local Croatian and Serbian population ( http://www.coordinamentoadriatico.it/index.php?option=com_content&task=view&id=1392&Itemid=61). In a nutshell: the Italians were two thirds of the inhabitants of Lissa in 1880 (or 64% of the total), but in 1900 -after only twenty years- they were reduced to just two percent! This was a massive ethnic cleansing, shamefully authorized by the Austrian Habsburgs in a subtle form ...... It is noteworthy to remember that in 1871 the Italians of Lissa sent a request (of course rejected) to the same emperor of Austria asking not to delete the Italian language bureaucratically and not to close their Italian schools in the island. In addition, between 1880 and 1900 the Italians officially disappeared in the population registers of the nearby Dalmatian islands of Ulbo, Mljet, Pasmano, Isto, Sestrugno, Zirona Grande and Bua (http://xoomer.virgilio.it/histria/storia...). With the passage of the island to the Kingdom of Yugoslavia after WWI, there was a further exodus of Italians and the few remaining were gathered around the figure of the noble Dott. Lorenzo Doimi-Delupis (http://www.amha.hr/2011_02/PDF/ 189_206_J ...), whose father Peter was the last Italian mayor (called: podesta') of Lissa in 1870: in 1927, there were 177 Italians all over the island, down to only 50 in 1930. It should be remembered that after the first world war at Versailles American President Wilson proposed the assignment of Lissa to Italy. At that time in the island there were still many Italians hopeful of "Irredentism's Redemption", hope evidenced by the tumultuous events of October 30, 1918 in Lissa and Comisa in which they showed their desire to be part of the Kingdom of Italy. In fact, among all the South-central Dalmatian islands, Lissa was the one with the largest community of Italian language between the Croatians. 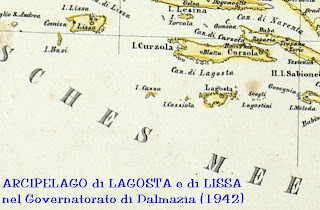 Moreover, even in the "Wilson line", based on the principles of ethnic majority and promoted by the President of the United States of America to the Versailles Peace Conference of 1919, the island of Lissa was included as the only one in Dalmatia that was supposed to go to the Kingdom of Italy. But with the arrival of September 8, 1943 came the end for all Italians in Lissa. In Lissa settled the same Tito with his General Staff in 1944: at the beginning of June 1944, the headquarters of Tito - along with British and Soviet military missions - had moved from the Yugoslavia mountains to the Dalmatian island of Lissa, due to a violent military offensive of the Germans against the heart of the partisan forces (the so-called "Operation Rösselsprung", in which the same Tito was injured). The presence of the worst Tito fanatics in Lissa was the coup de grace for the few Italians in the island: in fact, during and after 1945 all the very few survivors of the Italian community exiled from Lissa. In 1946 in Lissa there was not a single Italian: a perfect ethnic cleansing! That is, in 140 years in Lissa was implemented a complete and perfect ethnic cleansing: it was studied even by the infamous expert of "ethnic cleansing" of dictator Tito, Vaso Cubrilovic, when he lived in Lissa in 1944. ( http://brunodam.blog.kataweb.it/ 2008/06 / ...). After the Second World War the island was within Tito's communist Yugoslavia under the name "Vis" and since then suffered irreversibly a full croatization. The island was completely militarized until 1989, when it was reopened to tourism. Now it belongs to the Republic of Croatia. It should also be remembered that in the island since 1944 there was a famous concentration camp of Tito. This camp became notorious for the massacre of Italian soldiers which occurred after September 8, 1943. In fact, there were more than 50,000 of our countrymen deported to the concentration camps of the Tito's partisans in the former Yugoslavia. The survivors of the terrible Nazi extermination camps swear that those of dictator Tito were even worse. Only in 1943-44 on the island of Lissa were shot and then thrown into the sea 1800 soldiers of our army, Costantino Di Sante writes in his "In the fields of Titus. Soldiers, prisoners and Italian prisoners of war in Yugoslavia (1941-1945) "; Editorial Shadows Court; Verona, 2007. ".........In the concentration camps of the Tito's partisans the treatment of imprisoned Italian - counted in more than 50,000 - were inhuman.....in the numerous internment camps -names like Lissa and Biševo make disgusting sounds in the ears of those who remember - people were being treated like animals...... Indeed those of our countrymen who had had the experience of the Nazi camps admitted that those of Tito (there were 65 registered) were even worse than Auschwitz and Mauthausen. In addition, the anti-Italian sentiment of Tito's soldiers also struck those of our countrymen who, after the armistice of '43, had passed since then to the side of the partisans. As an example, Zappulla Sebastiano was in Ragusa (modern Dubrovnik) with the division Messina: after September 8, he was interned by the Germans in Sarajevo; escaped, he joined the anti-Nazi partisans. Was injured in battle and later was admitted to Lissa: "The partisans were trying to ignore the fact that I and my comrades had fought for the same cause and we were also injured. They called us fascists just because we were Italians. We were working like dogs, they did not respect our bad conditions of health" Zappulla declared in an interview to Di Sante..........."
From the island of Lissa the Military Staff of the Italian Navy on 8 January 1945 sent to the Foreign Ministry in Rome a dramatic report: "From 10 November 1943 to 20 December 1944, I calculated that have been shot about 1,800 Italian soldiers, throwing the bodies into the sea. The mass executions take place at Biševo....."
This is a lie,surnames were Italians,croats came later!